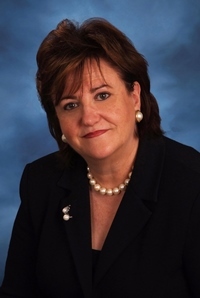 AMHERST, N.Y. – New York State Education Commissioner MaryEllen Elia, a graduate of Daemen College, will officially welcome more than 570 new students to the college as the featured speaker at the 2016 Fall Convocation scheduled for 11 a.m. Sept. 8 in the Lumsden Gymnasium. The all-campus event to start the 2016-17 academic year will include remarks by Daemen President Gary A. Olson, Dr. Michael Brogan, vice president for academic affairs and dean of the college, and other speakers from the college’s administration, faculty, staff, and student body. A luncheon in the Wick Dining Room will immediately follow the event. Elia will speak to the college’s new students on behalf of the Daemen College/Rosary Hill Alumni Association. Appointed in 2015, she is the first woman to serve as New York State education commissioner and president of the University of the State of New York (USNY). In her role as commissioner, Elia oversees the state’s pre-k through 12 education system that is comprised of more than 700 school districts with more than 3.2 million students; 271 public, independent and proprietary colleges and universities; 7,000 libraries; and 900 museums. Elia has 45 years of experience as an educator. Most recently, she was superintendent in Hillsborough County, Fla., which includes Tampa, the nation’s eighth largest school district. A Western New York native, Elia graduated from high school in Lewiston and went on to earn a bachelor’s degree in history from Daemen and master’s degrees from the University at Buffalo and SUNY Buffalo State. She was a social studies teacher at Sweet Home High School for 16 years and then moved to Florida, where she was a reading teacher and later held administrative roles in the Hillsborough County School District.